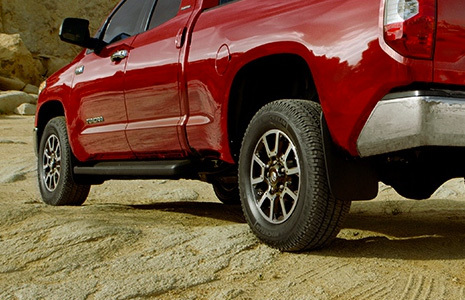 Maintain your Toyota's spotless appearance with Genuine Toyota mats & mudguards that are available in multiple styles from Tuscaloosa Toyota in Alabama ‐ serving Birmingham, Columbus, and Jasper. Toyota's Genuine All-Weather Mats are molded with a rugged, ribbed-channel design that traps elements like moisture, dirt, mud and debris, never to escape. The result is spotless carpets and a refreshing interior. Each mat is specifically shaped to fit your Toyota's unique interior, with skid resistant backing that secures placement. 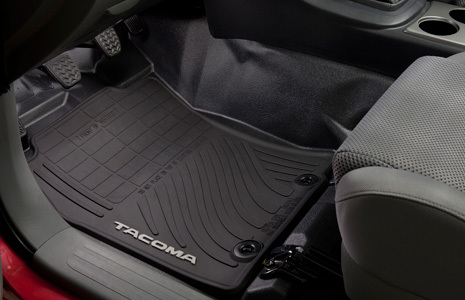 Driver's side mats also have special quarter-turn fasteners for additional staying power. For equal stain protection that's easy on the eyes, Genuine Toyota Carpet Floor Mats create a warm and inviting cabin with their fade-resistant, durable carpet material. Their skid resistant backing keeps them securely in place, while embossing display's your Toyota's model logo for a unified look. Nothing looks worse than a dingy car. Maintaining an immaculate exterior is made easier with Genuine Toyota Mudguards, which protect your model's paint finish from road debris damage. Available in sets of four, their sleek design makes them a subtle, yet highly effective vehicle add-on.